SES, EchoStar Corp., and Airbus Defence and Space announced today that the new EchoStar 105/SES-11 spacecraft, built by Airbus, has been shipped from the Airbus facilities in Toulouse, France, to Cape Canaveral, Florida, for its forthcoming launch by SpaceX in October. The first satellite that EchoStar has constructed with manufacturer Airbus, EchoStar 105/SES-11 will be launched by SpaceX on a flight-proven Falcon 9 rocket from Launch Complex 39A at Kennedy Space Center, Florida. EchoStar 105/SES-11, a high-powered hybrid Ku and C-band communications satellite, is a dual-mission satellite for US-based operator EchoStar and Luxembourg-based operator SES. EchoStar 105/SES-11 provides EchoStar with 24 Ku-band transponders of 36 MHz, marketed as EchoStar 105, while it provides SES with a C-band payload of 24 transponders, marketed under the name SES-11. EchoStar 105/SES-11 replaces Ku-band capacity for AMC-15 and C-band capacity for AMC-18 at SES’ well-established 105 degrees West orbital slot. EchoStar 105 was tailored to meet the Ku-band capacity needs of EchoStar’s enterprise, media and broadcast, and U.S. government service provider customers, offering coverage of the 50 U.S. states and expanded reach to the Gulf of Mexico and the Caribbean. SES-11, designed to accelerate the development of SES’s U.S. prime video neighborhood and optimized for digital television delivery, joins SES-1 and SES-3 at the centre of SES’s robust North American orbital arc, which reaches more than a hundred million TV homes. It also replaces C-band capacity for AMC-18, which SES offers over North America, including Hawaii, Mexico and the Caribbean, empowering businesses and governments to capture new opportunities and expand their reach. 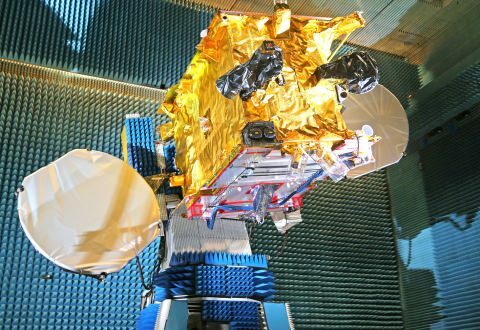 EchoStar 105/SES-11 is the 47th satellite based on Airbus’s highly reliable Eurostar E3000 platform. It will have a launch mass of 5,200 kg and spacecraft power of 12 kW.